Polka dots make everything better! They are fun and playful, yet can also be dressed up and elegant. Depending on the fashion source, mint is the color or one of the top colors of 2013, regardless of what the so-called experts say, I love the color mint and polka dots. So polka dots + mint + sequins = fabulous in my book! 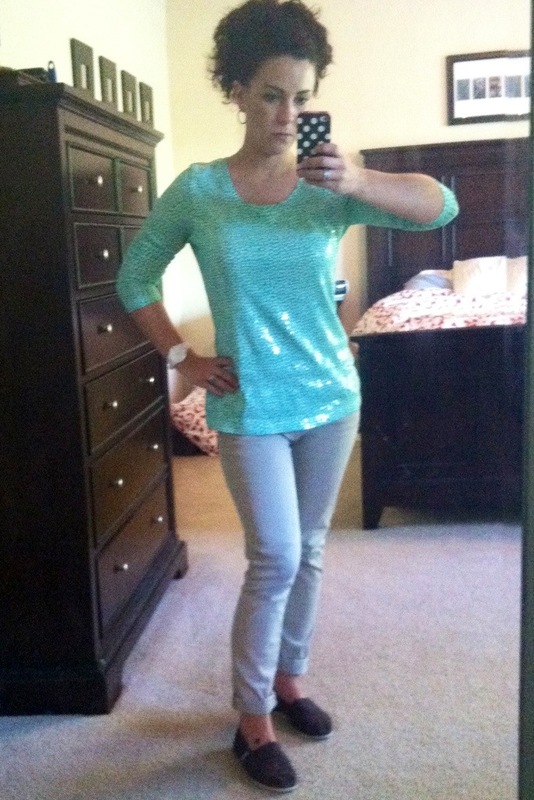 Mint polka dot and sequins top $4 from Old Navy, bought on clearance last week. Skinny Crop & Roll jeans in khaki $70 by 7 For All Mankind from Nordstrom Rack bought spring 2012. Chocolate Brown Toms Shoes $34.99 from Nordstrom Rack, bought spring 2012. 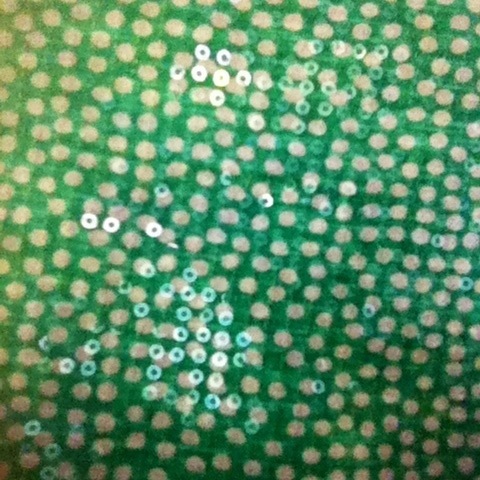 Had to show a close up of my shirt. I am drawn to shiny, sparkly things and I just couldn’t pass up this top, especially when it was only $4! 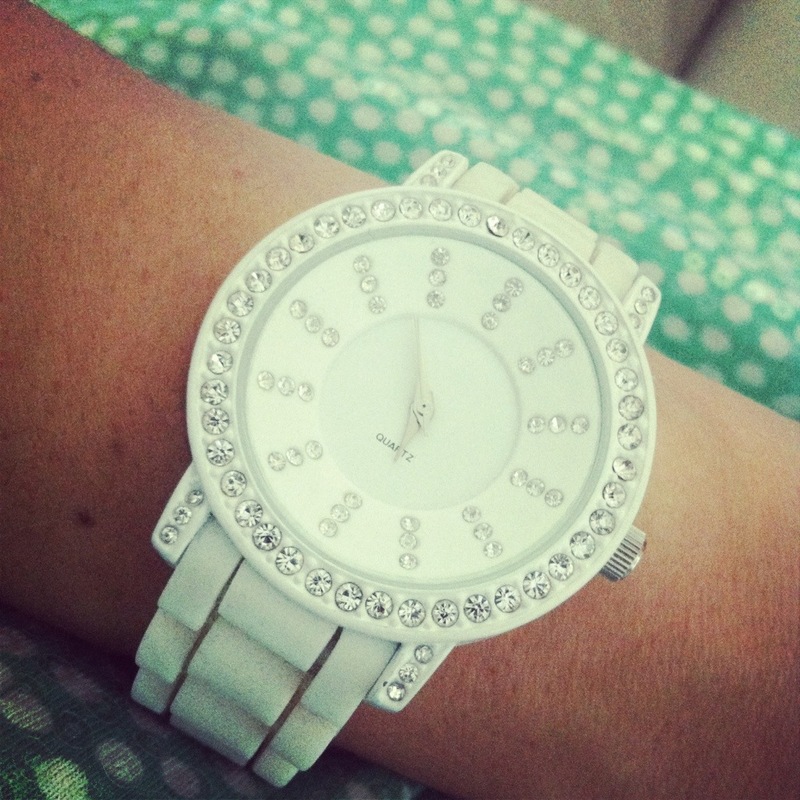 White boyfriend watch with rhinestones $9 from Target bought November 2012. Hope your day was fabulous. If you ever need a little pick-me-up in your day add polka dots, mint, sequins, and rhinestones and you will be good to go!